§7-601. Declaration of Snow and Ice Emergency. termination of the emergency may be given by use of the same media. §7-602. Parking Prohibited, Driving Motor Vehicles Restricted on Snow Emergency Routes During Emergency. A. To park a motor vehicle or to allow that vehicle to remain parked anywhere on any snow emergency route designated in §7-603. 1. 1. If, at any time during a period of snow emergency declared under §7-601 of this Part, a person shall park a motor vehicle or allow a motor vehicle to remain parked anywhere upon a snow emergency route, that person shall be guilty of a violation of this Part and, upon conviction, shall be sentenced to pay a fine of not more than $15 and costs. 2. 2. If, at any time during a period of snow emergency declared under §7-601 of this Part, a person shall drive a motor vehicle upon a snow emergency route, without having that vehicle equipped with snow tires or chains, that person shall be guilty of a violation of this Part, and, upon conviction, shall be sentenced to pay a fine of $25 and costs. Children and adults in Upper Dauphin County will again be treated to the usual sound and sight of Santa Claus on Christmas Eve-a tradition that has continued since 1934. In 1934, a four-cylinder panel truck decorated with evergreens traveled the streets of Lykens Borough with a jovial and generous Santa Claus offering treats to fascinatedchildren. Behind him, a one-horse sleigh kept pace urging all to keep the Season’s spirit alive and well. Santa, portrayed by Richard Roosevelt Klinger and his brother,Carlos, wanted to do something for the community. That was years ago. The truck, a Chrysler Fargo, has long since been a discontinued model, and fickle weather has made Fred Cooper’s sleigh impractical. But that modest effort to salute Christmas Eve became an annual celebration which has grown into an established tradition and is still maintained by the Klinger family with the willing assistance of friends and neighbors. One would have to be well past 60 years of age to even faintly remember life in the 1930’s. The depression, CCC camps, WPA, Joe Louis fights, traveling carnivals and minstrel shows, family and church picnics, and the Lone Ranger on the radio which opened and closed with the William Tell Overture. Life back then was exciting and uncomplicated for young children. The family as an institution was high on most people’s priority list. Mr. and Mrs. Richard Klinger, Sr., were married in August, 1925 in Elizabethville. They were the parents of five children, Marie, Robert, Richard, David, and Donald. In 1975 they were the guests of honor at a Golden Wedding Anniversary party. 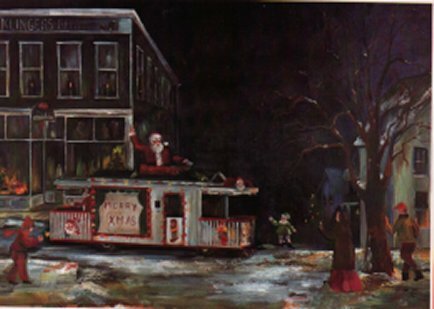 One of the gifts they received from their children was an oil painting which features Santa on his truck in front of the family business (shown above). The senior Klingers are now deceased, as is son Robert, who followed his father in the family business. Rich Klinger had been employed full time in the mines as were many people in the valley. In 1925, he opened a radio repair business on a part-time basis. The closing of the mines and the loss of his job in 1930 forced him into the radio sales and repair business. He had planned and saved wisely for the future. Going into business for yourself involves a lot of faith in yourself and the hope that there’s a market for your services. Over time, Klinger built his radio and sound operation into a multipurpose hardware and appliance store that had become a community institution. In the 1950’s, the use of portable generators enhanced the lighting and sound features and made the Christmas Eve event even more spectacular. The senior Klinger had since been replaced by son, Robert, who played the role of Santa for 45 years. Son Richard Earl Klinger next filled in and became the general manager for the project, a responsibility he continues to enjoy as preparations are being made for this year’s Christmas Eve trip. His son, Richard Eiler Klinger, has been “Santa” for the past several years, and indications are that grandfather Klinger’s tradition will continue indefinitely. The decorations on the truck (a fourth generation Santa Truck) have increased significantly since the first holiday drive through the borough. Now there is a wooden house with a chimney that fits on the back of a pickup truck, and this house even sports a mailbox. The number on the mailbox changes each year to mark the number of times the celebration has been staged. A second holiday truck also joined the parade in the 1950’s. Herbert McElhenney, a service station owner, outfitted a truck with a sleigh and plywood reindeer. Now there were two couriers of Christmas joy to delight young and old on those cold Christmas Eves. Soon, church members in Wiconisco, pleased with the custom but wanting to improve upon its secular nature, asked if they could participate in some way. They were welcomed with open arms, and built a scale model of a church on a pickup truck to join the procession. At the time, they also distributed presents of their own, plaster plaques with spiritual scenes and messages. A banner embracing the float advised onlookers to “Keep Christ in Christmas”. Several years ago, the Klinger family acquired the church float and they continue to maintain it. Members of the Klinger and McElhenney families began to devote laborious hours to preparing and improving the floats, and began to lengthen their pre-Christmas run. Keith Bingaman acquired the McElhenney business, and still participates in the Christmas Eve celebration. Santa’s Elves distribute 7,000 popcorn balls from both the Klinger and Bingaman trucks to the delighted children and adults who are young at heart. For a time, the floats were enjoyed in the Lykens, Williams, and Hegins Valleys, and included the boroughs , townships, and developments of Wiconisco, Loyalton, Williamstown, Tower City, Porter, Hegins, Valley View, Hubley, Gratz, Elizabethville, and Millersburg. The trip ran from 6 p.m. until after midnight. Over the last several years, the Christmas Eve travel schedule has been curtailed to the areas of Lykens, Wiconisco, and Williamstown. This has been made necessary due to todays increased traffic volume and to the rising cost of fuel, insurance and permits. Of all the community activities Rich Klinger, Sr., has been involved with, the Santa Claus drive was his favorite, Richard Earl Klinger said. “He did it for other people’s enjoyment and his own. And my dad did many things for other people, and didn’t expect anything in return. That was his nature”. “I hope we can continue this tradition for many years to come. Every year seems more remarkable to me”, Richard Earl Klinger said. At about midnight Christmas Eve, the sound of “Silent Night” can be heard as the Klinger Santa Truck makes a final run through Lykens. By this time most young children are asleep, and parents and grandparents have the opportunity to relax and enjoy the wondrous event that will happen next morning. They also have time to reflect and remember their days of innocence and youth and all the joys of Christmas past. Echoed carols of Yuletide…a glorious sound. All filled with the spirit and caught in the fun. Irregardless, the float was a beautiful sight. And the Jolly Old Fellow, it has to be seen. For the real Christmas feeling, the touch it all lends. With joyful expressions, this picture behold. That Santa’s as real as the feeling inside you. ‘Tis better to give than to receive. That heart is where home is at holiday time. Seemed to banish remorse and perish all grief. Rekindle our love for our fellow men. Till he finds that in life, you shall get as you give! In our efforts to provide more reliable communications with Residents and Businesses in the borough, we have implemented Swiftreach Networks, Inc. as our Emergency Notification service provider. Swift911™ in its simplest form is a system that makes phone calls to specific people or areas in the event of an emergency or for sharing important information. All the calls you receive will have the Caller ID of ‘LYKENS Borough’ or ‘Lykens Borough Police Department’. If you are not receiving these calls, please fill out the form below to add or update your contact information. You may also remove yourself from our lists.